There are 2 Homes Available at Aurora Trails! It’s been an exciting year in Aurora for Fieldgate Homes. We launched the final phase of our highly successful community, Aurora Trails. Today, there are only two homes remaining! 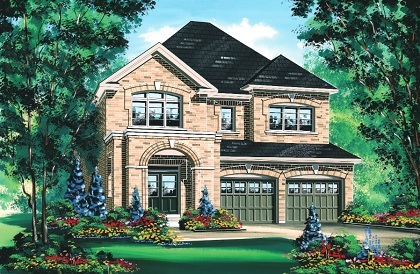 There is one townhome available and one 38’ detached home. The McLean Elevation B (top image) is a 3,016 square foot, 4-bedroom single with 3.5 bathrooms, and a spacious two-car garage. There is also a convenient walkout basement, which opens up to an expansive green space and extra long lot. The Foxglove Elevation A is a 1,571 square foot, 3-bedroom townhome with 2.5 bathrooms, and a single car garage. Aside from the amazing location at St. John’s Sideroad and Leslie St., where you’ll discover the town’s finest countryside setting, part of Aurora Trails’ success is owed to the fantastic luxury features and finishes. To name just a few, the townhomes offer 9’ first floor ceilings and 9’ tray ceilings in the master-bedroom, oak stairs, cold cellars, gas fireplaces, and prefinished natural engineered wood flooring. The detached homes at Aurora Trails offer granite countertops in the kitchens, ceramic backsplashes, 10’ tray ceilings in the master-bedroom, and stunning 3-piece marble facing on the gas fireplaces. Each of the final two homes at Aurora Trails comes with a great bonus with purchase. You will receive $8,000 to spend on incredible upgrades at our décor centre. Whether you want to spend that extra money in the kitchen or master-ensuite or anywhere else in the home, it’s up to you! For more information about your final two opportunities to own at Aurora’s most successful community, visit our sales office at Mavrinac Blvd. and Wellington St. on the weekend between 11 am and 6 pm. You may also call 905-841-8854 to book an appointment for a weekday visit. Please note that the sales office will be closed from December 24th until January 3rd, and will reopen January 4th at 1 pm.